ONGC has come forward to lend a helping hand to the Tripura government towards making the northeastern state open defecation free (ODF). 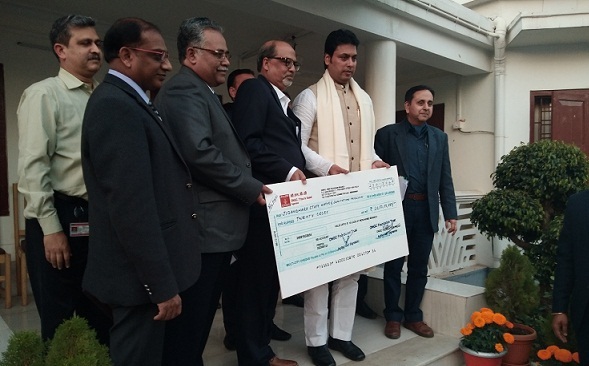 During a simple programme, Gautam Kumar Singha Roy, ONGC executive director and Tripura Asset manager on Wednesday handed over a cheque of Rs 20 crore under the head of Jibandhara State Water and Sanitation Mission (JSWSM) to Chief Minister Biplab Kumar Deb at his official residence. Singha Roy said this the first instalment of Rs 20 crore out of Rs 25 crore to the state account for ODF. A total of 20833 families will be able to get household toilets out of the fund. Meanwhile, Chief Minister Biplab Kr Deb praised the Oil & Natural Gas Commission (ONGC) for its support towards the people of Tripura and viewed that it has always been coming forward for the development of the state with its projects and CSR activities throughout the state. It may be mentioned that the state-owned Oil and Natural Gas Corporation (ONGC) organised a cycle rally at Agartala recently to promote the eco-friendly mode of transport among citizens. Tripura Education and Law Minister Ratan Lal Nath flagged off the ‘Saksham Cycle Day”‘ celebrations and paddled a cycle himself to encourage the people to adopt the eco-friendly mode of transportation. ONGC Tripura Asset partnered with Petroleum Conservation and Research Association (PCRA) to organise the rally where participants from the age of 10 to 75 years took part. ONGC’s officiating head of Tripura Asset Puneet Kishore and over 1,000 people volunteered for the cycle rally. The rally went around the capital city covering a distance of more than six kilometres.